Early Bloomer. Many tiny red-purple or yellow flowers in a fuzzy ball, broad leaves with spiny margins. Notes: Carrot family. 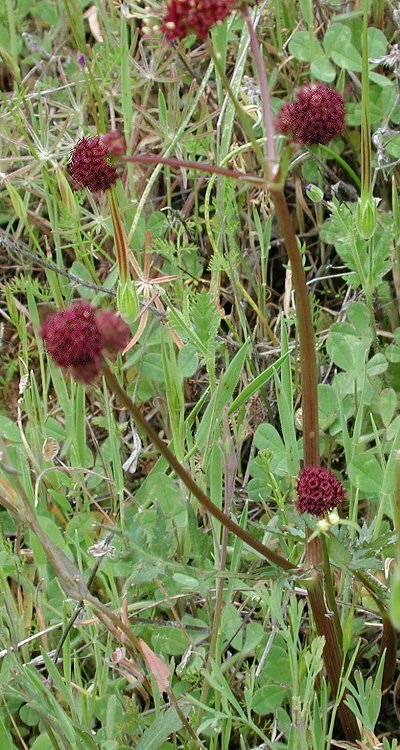 Sanicle seeds are rounded with bump-like hooked spines. Peterson lists them under both yellow and pink-red, and states that yellow is the most common on the western slope of the Sierra Nevada. However, we seem to have a lot of the deep red ones on the trail. Most are foul smelling and some species can be poisonous e.g., Sanicula bipinata or Poison Sanicle, which is very similar to the yellow form of bipinnatifida. Sanicle bipinnatifida is also called Shoe Buttons, Pincushions, or ‘Satellites’ because of the round flower head with extending stamens. The species name refers the leaf shape, which sometimes has a purplish midrib. Species Sanicula bipinnatifida Dougl. ex Hook.